Displayed below is a small selection of available artwork - click on an image if you would like more detail. Or use the menu above to browse our gallery by, artist, type or subject. Welcome to our revised site which we hope will enable us to bring you a more diverse range of artists' work than ever before. We had hoped to have this available ages ago but, believe it or not, we have been rather busy this year and we are not getting any younger. We have been regularly asked about our new offerings and we now have a lot included on the site. There is much more to come and so please keep looking in case the management have had a spare moment. to add more. If, however, your requirements are not represented on our website, please do contact us and we will do our very best to help. 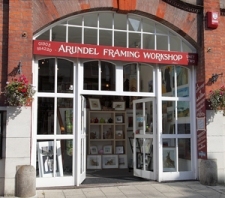 For those who don't know us, the Arundel Framing Workshop is located in the Historic Castle Town of Arundel in beautiful West Sussex which is well worth a visit at any time of the year. Whilst we try to update our images regularly on the website it might be impossible to show everything which is available. There is a wide selection of artwork on show in the gallery which is not represented on the website so why not pay us a visit. If you have anything that needs framing bring that along too.We have many mouldings to choose from and offer friendly advise on all your picture framing needs.